Using the idea that switching from a 12 gauge acoustic guitar to a electric guitar will feel lighter easier on the fingers and quicker to play. Can the same be said about the pick gauge you choose. Would it be beneficial to use a lighter pick and then switch to a heavier pick etc. covering all bases on electric etc not so much acoustic. What do you do when practicing your technique? I practice using the pick I’ll perform with. I’m not really a fan of deliberately trying to strengthen the fingers by using heavy strings because dexterity and accuracy are more important than outright strength. What can happen is you get used to pushing harder and this can cause you a problem longer term. This is of course only if 12s are heavy to you - if they’re normal then that’s fine. I had a number of injury issues last year some of which were exacerbated by too much tension in the fretting hand. So YMMV but I’d be cautious of trying to get ‘strong’... if you play regularly enough your hand/fingers will inevitably wind up strong enough to play the parts you need to. 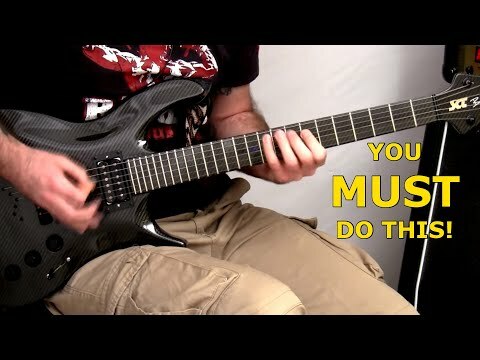 Assuming this originated from the stamina thread most fast metal rhythm riffs are easier to play on heavier strings due tongue increased string tension. Yep it did. I've been experimenting with a few different picks. Leaning towards Dunlop 3mm stubby. The recess helps me keep the pick from moving as much. I'm also of the opinion that you should practice with whatever it is you're going to use. If anything, I've found having a bass around can help with strength and dexterity, and left hand economy. Hi mate. Thanks for the link, i will have a look and spend some time with it. Ive ditched the 3mm stubby and gone with the 1mm stubby for now. Instant improvement with strumming and feels are lot smoother to use though I cant feel the pick biting into the strings as much so i will have to get used to the lightness. I studied the Troy Grady stuff for the last few years and it has helped me and made me more aware of my picking but I wasn't making huge progress in terms of speed - I top out at around 16th notes at 130 - 135bpm. The thing I find about picking is that it can be frustrating trying to speed up your motions when you aren't making much progress. Troy Grady swears by being able to play a lick fast, having a smooth feeling motion, but if you are playing it sloppy then don't worry. He says that you can clean it up later. I disagree with this. 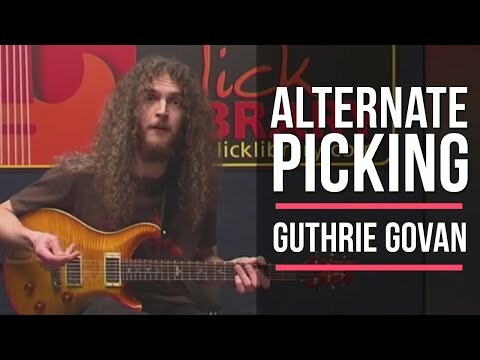 I think it was either Guthrie or Shaun Baxter who said if you are learning to play a lick fast and sloppy then you are just drilling in sloppy motions. Having said that learning things slow and gradually speeding up the metronome is boring and wont get you anywhere because the motions for playing slow and the motions for playing fast are so different. You really need to be able to drill in the motions for a lick at a good medium-fast speed, be able to play it cleanly and smoothly at that speed, and then speed things up using a motion that is fast but feels smooth and efficient. 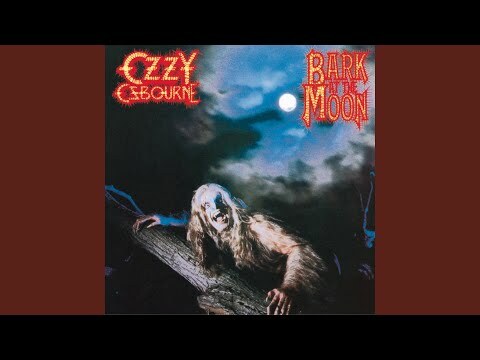 I've tried learning that Bark at the Moon section and I can't play it up to speed. The rest of the song is fine for me. The fast picking part I play using hammer ons and some picking and I can get it pretty smooth up to speed. I have been experimenting with rearranging licks so I can play them using Reb Beach style happing. however, don't get too hung up on not being able to pick fast because you will get frustrated if you can't do it. It can also get boring trying to play licks up to speed and you're sitting there repeating and repeating them over and over again. If you can play a lick fast using legato or tapping then I say go for it! @bingefeller What speed can you trem pick at and is your trem picking mechanic radically different from your "normal playing" like EVH's is? (As Grady illustrates.) Can you play fast, thrashy (alternate picked) rhythm parts at the original tempos (these are usually on the bass strings). E.g. Anything faster than Into The Arena? Two things i have found to be helpful to me recently. Starting on a up stroke and accenting. Using accents on the 1st beat (when starting down stroke)and 4th up has helped me get the speed up on triplets. Starting on a upstroke i find can make changing strings easier sometimes which is something i haven't thought of doing. I tend to play things slowly and then try and increase speed.The change of pick i am getting used to. 1 mm is the thinnest ive used for a while and to be honest its a better feel than the 2 to 3mm i usually use. If I try to trem pick holding the pick with my regular grip (thumb and index) I end up using my forearm. if I try to pick this way it becomes really sloppy and I can't control it. I can trem pick smoothly holding the pick between my thumb and middle finger (I will post a video later). I don't know why but it's very comfortable for me. It's like it gives me a different mid point and my wrist pivots better. @bingefeller Can you play normally with a thumb/middle finger grip? IA does, nowt wrong with that. I only really tried doing it last month, from when Troy Grady posted on his blog about Eddie Van Halen's technique, so I haven't been practicing with it that much, but yes I can play normally with it. It feels very efficient and smooth. @bingefeller ; I've not followed Grady terribly diligently, what I remember him saying about EVH was ages ago, when he pointed out how differently Ed trem picks on one string to when he's doing string-crossing lines. I reckon that you need to build up from short bursts of fast picking to escape your speed plateau. @DLM cool video, I hadn't seen that before. It has some very good ideas. I will post a video of EVH style picking later. It's good for one string but, for crossing strings, it needs practice. Troy Grady has a Joe Stump interview coming out soon so that should be quite good.